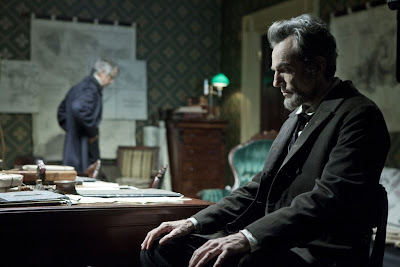 Google+ Cinema Viewfinder: Is Lincoln Meant to Caution or Console? One wouldn't be entirely mistaken in assuming that the parallels Steven Spielberg and Tony Kushner make between Abraham Lincoln and Barack Obama are deliberate and calculated. Lincoln's Abe (Daniel Day-Lewis) is a figure equally worshiped and reviled by a country split in half over the issue of slavery. With the Confederacy's chances for victory dwindling in January 1865, the span of time the majority of Lincoln focuses on, the president realizes now is the time to go for a grand bargain: pass the 13th Amendment that would allow blacks to be seen as equal in the eyes of the law. However, the Emancipation Proclamation, Lincoln's attempt to ram the slaves' freedom down the country's throat, inspires the Confederates to accuse the President of being a dictator. And the radical element within Lincoln's own party, led by Thaddeus Stevens (Tommy Lee Jones), will not settle for anything less than obtaining the right to vote for African-Americans. In our own time, the nation and its two political parties have been divided by far less–national healthcare–while President Obama has tried to "lead from behind." So there's no doubt as to the correlation Spielberg and Kushner are making when Stevens tells Lincoln, "I lead. You should try it sometime." What makes Lincoln's allegorical aspects more problematic though is the fact that the parallels are not exactly one-to-one. The word "radical" is seldom heard alongside "Republican" nowadays. But yes, it was the conservatives who pushed for freeing the slaves against a very resistant, southern group of Democrats. This factual but unusual reversal–socially liberal Republicans and recalcitrant, antiquated Democrats–is one that should give pause to even the most partisan of us. For one thing, this switch demonstrates the vast chasm that lies between the way each party perceived itself (and each other) then versus now. Secondly, the ability of this "rat's nest of talentless hicks and hacks"–as Secretary of State William Seward (David Strathairn) refers to the House of Representatives–to come together to pass a divisive constitutional amendment endows Lincoln with a touch of inspirational optimism for our times. Lincoln isn’t so rife with the earnestness that pervaded Spielberg's War Horse (2011) as to ignore that the House's two factions didn't as much compromise as they settled on a solution... in part because of Seward's behind the scenes wrangling of moderate Democrats through bribes offered by three unsavory negotiators (John Hawkes, Tim Blake Nelson, and James Spader as the film's comic Greek chorus). But Lincoln does propose that even at its most fractured and cynical, our political system does offer other avenues towards settling the most vehement disputes. Many originally thought the November release of Lincoln was timed to encourage the left-wing base in anticipation of the presidential election. But its delay to just after the event places it in a new context. Viewing it in light of the election instead of ahead of it crystallizes much of the discussions occurring now as Republicans reassess their positions vis-à-vis their shrinking constituency. The film's Lincoln feels the pressure of inevitability the same way all national leaders do, now more than ever. Lincoln's haste in enacting the 13th Amendment is motivated less than by any humanistic motives than by a desire to stay on the right side of history... to stay relevant. There is much to admire in the wise, folksy storyteller Abe is depicted as in Lincoln, a man who could spin just the right anecdote to rally the rivals around him to common cause. But like Obama he hasn’t always displayed patience in enacting the policies he proposes. Nor, like Obama, has Lincoln proven as deft at uniting feuding governing factions as he has his ardent supporters. A cautionary tale for our leaders, Lincoln is a fact-based fable whose lesson is that good can come from taking the time to understand and reach out to those who oppose you. As much as anything else it is purported to have been intended for though, Lincoln is meant to console. In illustrating the depths to which America sank more than 150 years ago–barely 90 years after its declaration of independence–Lincoln demonstrates that our nation is strong enough to weather even the bitterest division provided there is leadership and compromise from even the staunchest partisan. It is a lesson that, if for no other reason than survival, our political leaders have started listening to. I just hope our citizens pay heed as well. Well I can say that Lincoln is one great president. I think the Obama-Lincoln connection was definitely conscious, though probably not entirely intentional (in other words, they probably started writing it before correspondences became obvious, but couldn't help being aware of them once they did). Can't quite agree with your characterization of Lincoln - or Obama for that matter - as being impatient or divisive (unless I'm misreading you on that point); in both cases, I think they did about the best they could with recalcitrant opposition (obviously more severe in Lincoln's case) and that they correctly read their respective times in pushing certain policies through (and both were, in large part a mixture of idealism and pragmatism - too pragmatic for a lot of other idealists). This is certainly not to say Obama is a leader on par with Lincoln just that, in teasing out the connections I don't they redound particularly negatively. In terms of correspondence, I don't think Lincoln would have worked nearly as well pre-election. Mostly I suppose for the obvious reason that the timing of Lincoln's plot links up perfectly with where Obama's at now - a couple months before second inauguration and all the ramifications of that, including the possibility that a weathered but hellbent opposition might finally be possible to start peeling off. To expand on that last point more particularly, aside from the Obama connection: I'm fascinated by the choice of setting for Lincoln. I can't think of many other biopics that seem to be so "post-" In a way, the climax comes before the movie (as Lincoln is validated by the election and the tide of war finally turns after 3 long years) and the movie teases out a second climax from the material (I mean how often do we hear about the 13th amendment as the big breakthrough vs. the Emancipation Proclamation?). Your insightful comment is the best I have read about Lincoln. "In illustrating the depths to which America sank more than 150 years ago–barely 90 years after its declaration of independence–LINCOLN demonstrates that our nation is strong enough to weather even the bitterest division provided there is leadership and compromise from even the staunchest partisan." As political inspiration, I'm sure Barack will see this and gain courage.